10 • FOODSERVICE EQUIPMENT & SUPPLIES • OCTOBER 2018 people & events The percent of restaurant opera- tors that plan to make a capital expenditure for equipment, expansion or remodeling in the next six months, per the National Restaurant Association's July Restaurant Performance Index. 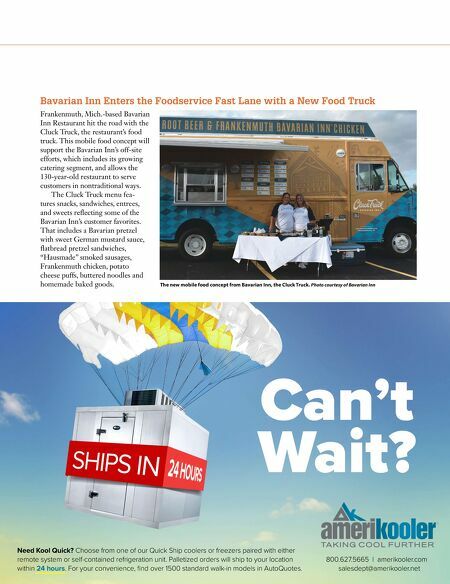 59% The number of test stores Dunkin' Donuts will have with dedicated pickup areas, digital ordering kiosks and expanded drive-thru windows that priori- tize orders via mobile app. The intent is to improve order speed, accuracy and convenience. 50 The percent of all consumers that Generation Z will repre- sent by 2020, per a study from Engagement Labs. 40% The level the National Restaurant Association's Restaurant Perfor- mance Index hit in July. Despite the .6 decline from June, the RPI remains in growth mode. 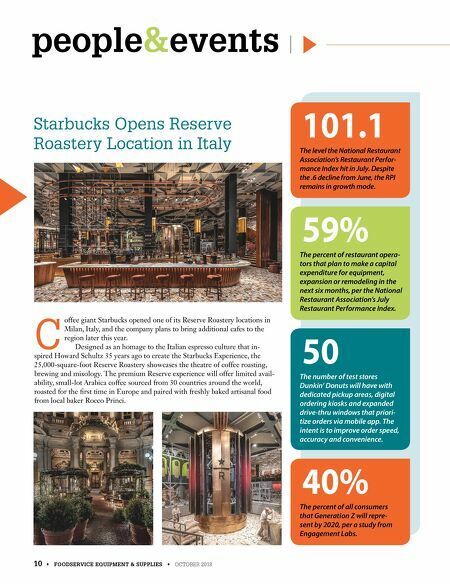 101.1 Starbucks Opens Reserve Roastery Location in Italy C offee giant Starbucks opened one of its Reserve Roastery locations in Milan, Italy, and the company plans to bring additional cafes to the region later this year. Designed as an homage to the Italian espresso culture that in- spired Howard Schultz 35 years ago to create the Starbucks Experience, the 25,000-square-foot Reserve Roastery showcases the theatre of coffee roasting, brewing and mixology. The premium Reserve experience will offer limited avail- ability, small-lot Arabica coffee sourced from 30 countries around the world, roasted for the first time in Europe and paired with freshly baked artisanal food from local baker Rocco Princi.